David is a partner at MMPS who practices in the Litigation Group. 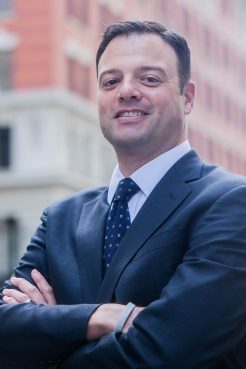 He is a seasoned litigator with considerable experience handling a variety of commercial matters, including real estate, debtor-creditor, and other business disputes, which he litigates before State and Federal Courts and arbitration tribunals throughout New York. He has a true expertise in handling insurance coverage disputes, including the defense and prosecution of lawsuits seeking judicial determinations of coverage and involving extra-contractual claims, under Commercial General Liability, Errors and Omissions, Directors and Officers, Homeowners, Auto, and other commercial and personal policies. He represents and advises insurers and policyholders concerning coverage for claims involving breach of fiduciary duty and other professional obligations, bodily injury and property damage, personal and advertising injury, bad faith, construction defects, employment-related liability, products liability, auto liability, and fraud. David’s work has been recognized by the “Super Lawyers” publication, which selected him as a “Rising Star” in 2015, and a “Super Lawyer” in 2016, 2017, and 2018, in the field of insurance coverage. As a law student, David was a founding member and Supervising Editor of the Cardozo Law Public Law, Policy, and Ethics Journal and a Teaching Assistant in the Cardozo Legal Writing program. He is currently a member of the Torts, Insurance, and Compensation Law Section of the New York State Bar Association.